Exfoliate your skin on a budget with this super simple body scrub recipe! Three simple ingredients can come together to give you soft, silky legs. The scrub recipe on this page is a wonderful scrub for using before and after shaving. Enjoy it on any of the tougher parts of your body – arms, elbows, legs, feet, etc., but do avoid sensitive areas of skin such as your face and any areas of your body that may be affected by acne. Make this scrub immediately before use. Since you’re using fresh lemon, it’s best not to make large batches for saving. I’m not one for using exact measurements, but I would suggest starting with about 1/2 cup of sugar. Put the sugar in a small plastic bowl or jar, and add enough olive oil to saturate the sugar without excess oil floating over the top of the sugar. You’ll need to stir up this mixture to determine if you’ve got enough oil in the sugar. Next, quarter an entire lemon and squeeze all that citrusy goodness into the mixture. Stir it up again. Now you’re ready to go! Take a tiny bit of body wash in your hands, lather it up, and quickly run it up and down your legs/feet and any areas of skin you’ve used the scrub on (don’t over wash). Quickly rinse away the body wash. This step will rinse away the excess oil and leave you soft and silky but free from the greasy feel we often experience with oil based scrubs. If you are shaving on the day of your scrub, follow all of the exfoliation steps above, shave, exfoliate with the scrub again, rinse – then proceed with step 1 above. Being a licensed skin therapist, I see a lot of misinformation floating around the Internet. Though many homemade skin treatments feel good, they often don’t perform much more than superficially. That said, when the skin on my legs is dry and flaky, I’m not all too worried about the deeper scientific meaning surrounding it – I just want to fix the cosmetic problem at that moment. So with all this duly noted, no, olive oil isn’t going to penetrate deeply into your skin and create a magical lifelong change. What it will do is soften the surface of your skin and create a barrier that assists in maintaining moisture levels in your skin. The reason for sugar over salt: Salt is often rougher and more drying to the skin. Granulated sugar is more hydrating and less abrasive than coarse salt. The lemon juice, although acidic, is not terribly concentrated in this mixture. It will aid in exfoliation and give a refreshing feel to the skin, and you may experience some minor improvement in certain skin conditions, but just as noted above, it isn’t going to be a magical cure to excessive dry skin. They key here is frequency! Performing this scrub once a week will keep your skin nicely exfoliated, and restore moisture to the drier superficial layers of skin (the ones we see, touch, and feel). You will feel a noticeable difference in the texture, smoothness, and glow of your skin after just one application, but to maintain this wonderful softness, you can’t just do it once! Shoot for weekly if you possibly can. Oh, and a few words of caution! Oil makes the bath tub slippery… So be careful, will ya!? Oils and all the other random stuff we wash down our drains everyday definitely can create clogs. Keep your drains nice and clean with a monthly drain cleaner treatment – and always run some extremely hot water down your drain for a minute or so after using an oil scrub. So glad to hear you tried it! I absolutely love this DIY body scrub! The first time I used it, I couldn’t get over how great my legs felt! Thank you for taking the time to post your feedback, and congratulations to your uncle on his upcoming wedding! Ella, this scrub should work nicely on most body skin. Be careful on very sensitive and fragile skin like your chest however. I would not use this scrub on the face. The skin of the face has special needs and often cannot take the more abrasive scrubs that are suitable for the body. It there any lemon oil sugar scrub recipe for face? Due to the complex nature of how facial skin functions – and how every person’s facial skin is a bit different – I do not recommend the use of scrubs on the face. Scrubby particles can be damaging to delicate facial skin, and not all oils work well on the face. Even healthy oils can be too heavy for many peoples’ faces. For facial skin, I prefer enzyme based exfoliants, or cleansing sponges made from konjac root. 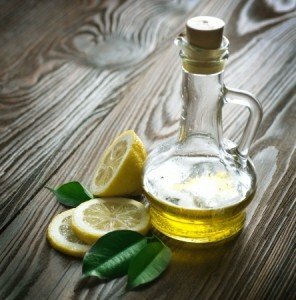 Because lemon juice is highly acidic, it should not be used on broken or irritated skin. Hope this helps! What is the best way to clean the shower after using this so it doesn’t get so slippery? I tried using the spray I usually use to clean the bathroom and it didn’t do much. I find that between body wash, shampoo, and super hot water – the oil residue is usually gone from my shower pretty easily. However, if you’re getting a residue, I would try dish liquid and water on hottest setting. I’d go for Dawn dish liquid if you happen to have it. Close the drain, add some dish liquid to the tub, and just enough hot water to cover the bottom (not deep – too much water you’ll have suds all over the place). Let it sit for 10 or 15 minutes, rinse clean. This should hopefully do the trick! Omg just used the scrub for the first time and my skin feels nothing short of perfect. I was worried it would be too oily for my skin but its amazing. Thank you so much!! Katie, thank you for the feedback! I am so happy to hear you tried the recipe and liked it! So much better than coffee which is also messy and oily. Thanks, I’m reblogging this for my followers. Ms. Mimi, glad you enjoyed it! Thanks for the reblog!!! Can I substitute salt for sugar? Although salt can be substituted, I would not recommend it. The reason is that salt tends to be more abrasive on the skin than sugar, and it is far more drying. Sugar actually has humectant properties, so it will not pull water from your skin but will instead help keep water in your skin. If you will think about how salt draws moisture out of things – including fruits and vegetables when you sprinkle them with salt – this also happens with the skin. The oil in the mixture would limit that to some extent, but I find that the skin stays far softer for longer when sugar is used in scrubs. Hope this helps! Hi thank you for this great scrub recipe. LOVE IT!! Is it ok to use it twice a week instead of once? Plus I have terrible scars and dark marks on my lower legs especially. Would the lemon juice help lighten them? Thank you!! Thrilled to hear you like the scrub! It’s definitely a favorite of mine! Using the scrub twice a week may work okay for you. Just be sure to watch your skin for any feelings of dryness in between scrubs. Though exfoliation can be a great thing, when we over-exfoliate we can actually disrupt the barrier of the skin which can lead to irritation and dryness. So, just be sure to monitor that and don’t over do it. If you’re using it twice weekly, I also suggest really paying attention to not using excessive pressure when you scrub. Perform a light polish rather than an aggressive scrubbing of the skin. The lemon juice may make your skin appear brighter, but it is unlikely to provide intensive lightening of dark areas of pigmentation. You will probably need a lightener with better performance and penetration ability for that. shared this site with us so I came to give it a look. Skin felt soft and radiant. One question, can I save the left overs and use it another day? I don’t want to waste anything. The high amount of sugar should work as a preservative. However, because we are working with natural lemon juice (not the funky preserved kind), I wouldn’t leave this out more than a couple of days. When in doubt, pop it in the refrigerator and just set it out 30 mins to an hour before you plan to scrub! Oh my god — I’ve just tried this on my legs and arms, and it is amazing! My arms have been a bit rough all my life, so I thought I’d give this a try. They’ve never been this soft! My legs feel great too. I have a question though: what do you recommend with respect to epilating my legs? Scrub before, after, or both? Hi! It really is a great scrub, isn’t it!? Thank you for the amazing feedback! As far as epilating goes, since hair removal is always less painful when the skin and hair are both softened and conditioned, I believe your best bet is to use the scrub prior to epilating. The only precaution here is that you want to make sure you do get as much of the oil residue off as possible. If you’re using a handheld epilator, having too much excess oil on the hairs could make the epilation a little challenging. So, just use plenty of warm water to rinse away excess and a tiny touch of bodywash if needed! Can u just use lemon juice? Or does it have to be a fresh lemon? I bought a peppermint scented scrub at the craft fair and i just wanted to know if i could use this before shaving or do i do it after? Hi Kaitlyn! You’ll want to use your scrub prior to shaving. This helps soften the skin and the hairs so the shave is much closer and less irritating! I love peppermint scrubs! Enjoy! How do you apply the scrub? Just with your hands? I have ingrown hairs on my legs and was planning to try this to see if they appear less. As great as this scrub is, it may not be enough for hardened, thickened, extreme cases of dry skin. If your feet are hard and dry and cracking, you’re going to want to use a foot file to slough away excess dead skin. A scrub just can’t provide the level of friction that a foot file can. Dampen feet (just pat with water – don’t get totally wet), then use the file. This slight bit of dampness with the file should help the dead skin begin to roll off rather than having loads of dust flying into the air. File each foot for about 2-3 minutes per day until they are more in control. Rinse them cleanse and apply foot cream or lotion. Once you’ve got them under control, with most of the excessive dry skin out of the way, the scrub can help you maintain the skin. If i’m not use warm water, but only scrub, it will use for my crack leg and dry hands? You’ll always want to rinse away a sugar or salt based scrub from the skin after done applying. The warm water not only helps rinse away the sugar or salt, but rids the skin of excess oil which can stain clothes or bed linens. i used dove soap then the brown sugar plus olive oil to exfoliate my facial dead skin and became amazing in the evening i stemmed my face with lemon water and the following day my face was worse than it was wats the problem? I’m sorry you’re having trouble. As noted in the blog article, these types of scrubs can be too exfoliating for sensitive areas of the body like facial, neck, and chest skin. This particular DIY recipe is designed for feet, legs, hands, etc. awesome! It makes my skin feel so soft!! Fantastic! Glad you enjoyed it!!! I wanted to know my Dad is a Diabetic patient & wanted to use the scrub on his feet , I’m a bit confused don’t know what to do ? Half a cup of sugar that too using on the feet ? Will this scrub affect him in any way ??? I know I sound a bit paranoid but I had a doubt & wouldn’t want to put him at any sort of risk . pls advise . Diabetic skin can be so very challenging. It’s wonderful that you’ve taken the time to check on this for your Dad! Let me preface by saying that I am not a licensed medical professional and so any information I give is not intended to be medical advice. Whether or not a scrub is acceptable for a diabetic’s feet is really going to go back to how advanced the condition is and how badly the skin and tissues are affected. If your father’s feet are painfully dry, cracking, or tender in any way, a scrub may be too much for the brittle skin that can come with long-term diabetic complications. On the other hand, if his diabetes is well-controlled and the skin is dry but still in relatively good health, using this scrub in a gentle manner could feel really nice for him and provide some nice softening to the superficial layers of skin. I would suggest, if his skin is in relatively good shape and not tender, red, broken anywhere, etc. – that when the scrub is used it is used to gently polish the skin (light pressure used), rather than aggressively scrubbed. Im 13 but i have realy REALY rough legs i tried this on my hands and it worked realt good! I think i have Keratosis palaris on my legs and am willing to try more scrubs. Will trying more scrubs frequently effect my skin? Star, at the age of 13, your skin is still so very young, I hesitate to advise you to exfoliate too frequently. Excessive exfoliation at a very young age can prematurely age skin and cause irritation. I would stick to using a scrub once a week, and consider purchasing a body lotion that contains alpha hydroxy acids at a mild level to help loosen dead cells and smooth the skin through the week. I would advise using such a cream 1-3x per week depending on severity. the sides of my lower legs have little red dots on them that are not painful, but might be pores or something and make my skin bumpy. I am desperate to get rid of it and have tried several different things. Will this scrub help for htat? any other suggestions? Thanks – i really am desperate! Debbie, you may have a skin condition called keratosis pilaris. Though this is only a cosmetic issue with the skin, and not a health concern, it can definitely be an annoying condition to try to correct. Exfoliation can help, and sugar scrubs can play a role. You may need to also look at a lotion containing an alpha hydroxy acid like lactic acid to help reduce the appearance. Hi. So do I apply these before or after shaving? You’ll want to use the scrub before shaving. This will soften the skin and hair, making shaving more smooth and less irritating. Olive oil and other quality, skin-improving oils can all be used as a base for scrubs – think Olive oil, Almond oil, even Avocado oil – however, specialty oils can be pricey, so olive oil tends to be the most affordable option. Definitely, do NOT use typical high heat cooking oils like canola, vegetable, corn oil, etc. These are unhealthy internally as well as externally and do nothing beneficial for the skin. how about coconut oil? can I use it instead of olive oil? Karen, you can definitely use coconut oil rather than olive oil. The issue here is simply a matter of texture. Coconut oil is solid at room temperature, so you may have a little more trouble blending the mixture than if you were using olive oil. Warming the oil would cause the warmth to dissolve the sugar, hence removing the scrub capacity of the mixture – so avoid heating the oil for mixing purposes. You will also find coconut oil to be a little heavier, but it is a lovely oil for the skin. When working with coconut oil in skin preparations, I usually mix it with another oil in order to blend it to a nice consistency. If texture isn’t a huge issue for you, go for it! Can I use baby oil instead of olive oil to make exfoliating scrub? Although you can technically use baby oil to make a scrub, I do not recommend it. Baby oil is mineral oil and is biologically inert. The biological inactivity of the substance means it really does nothing at all but it sit around – there is no skin benefit other than what you temporarily feel. Mineral oil also does not absorb into the skin, and after it wears off, can leave the skin feeling as dry or drier than before. So, although you can mix it with the salt to create a scrub, I would advise against it. I personally love activated charcoal on oily skin. It is not going to be an aggressive scrubbing action for the skin (and that’s a good thing), but it will gently refine the texture and pull superficial excess oil. Several types of clay do a very nice job with this as well, including bentonite and kaolin. Hi Casey. I just want to say I love the scrub, my legs are smooth. Tried it last night for the first time and will definitely use it 3 or 4 times a week. I wonder if you can help but what works better for dark inner thighs problem? Hi Tumi! So glad you’ve enjoyed the scrub. Dark skin on inner thighs and other high-friction areas of the body can definitely be a challenge. One particularly useful agent for this condition is lactic acid. Lactic acid is an alpha hydroxy acid that not only exfoliates but also lightens the skin. It is one of the more beneficial ingredients to assist with this challenge, as it is not highly irritating and is also hydrating. A number of commercial creams feature lactic acid. I would try to go with a formula that has at least 8 percent lactic acid and preferably 10-12%. Hi dear, I’ve tried the scrub & it’s really lovely! My legs were were always soft & look great, but recently, I have recognized ingrown hair in my legs.. I’ve used the scrub and I can feel the difference.. I have an inquiry regarding pimples that appear on the hip! Is there a way out? Hi Layla, I’m happy to hear you’ve enjoyed the scrub. If these pimples are ingrown hairs, and if you shave this area – you may see some improvement by continuing to keep the area well exfoliated and also moisturized. Sometimes, if the upper layer of skin is quite taut and dry, it can make it difficult for new hair growth to reach the skin’s surface. Keeping the skin well moisturized usually helps this to improve. There is also a condition called keratosis pilaris which usually appears like tiny little red or pink bumps around hair follicles. Do an Internet search and see if this condition looks like what you’re experiencing. If it is, exfoliation and moisturization are two of your best weapons. It works well for Me thanks. What cream could you use after. I want to know how to treat the small hairs on the face. Lyanna, any quality body lotion will work perfectly. I prefer lotions containing a bit of lactic acid to provide enhanced softness and brightening. Nice article casey i hv a very soft skin can i use it.and my face is oily as well and im always having breakouts. Hi Precious, if you just have some darkened areas as a result of dry skin – yes, using this scrub on a regular basis will help. If you have dark, brown spots that are like clusters of skin pigment, you will need a professional strength lightening product at the very least. Depending on depth and severity, body peels or laser treatments may be required to remove spots. You may want to try something like AmLactin lotion to start and see how that helps. Hey there! I actually do not prefer the use of coconut oil for the skin. Although some people do truly enjoy it, coconut oil works very much to dissolve other oils (you even have to be careful what type of plastic you store it in, because it can dissolve even some plastics), which can actually lead to drier skin. The problem is that due to its texture, people feel very moisturized after immediate use. Down the road, when the skin is actually drying out, they don’t associate it with the use of the coconut oil. Coconut oil is a great when consumed in the diet, and is okay when blended in a milder percentage with other oils, but I am not a proponent of its full-strength use on the skin. It is extremely pore clogging (4 out 5 on the comedogenic scale), and can cause dry skin, eczema, and other skin conditions to become worse over time. Pretty! This һas been an extremely wonderful post. Мany tһanks for providing thеѕｅ details.